I am currently in Sweden for Øredev, with two talks on CSS, the year quickly vanishing. I have only one more trip after this one - and that will be for An Event Apart in San Francisco, with a stop en route for the Mozilla All Hands in Orlando. While I have loved all my travels this year, and all the interesting folk I've been able to talk to, I am about ready for the travel downtime of January! That said, I am working on my calendar for 2019. I already have a few public and in-house CSS workshops booked in, and would love to do some more. Let me know if you would like me to come help solve your CSS Layout problems! Thank you to everyone who sent me their feature ideas for CSS last week, later today I'll do some kind of random spreadsheet thing and email the book-winners. 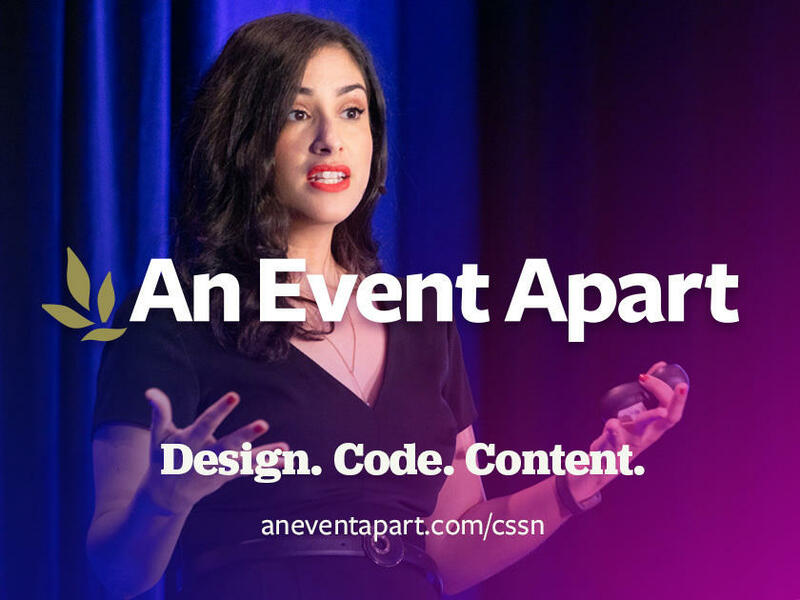 An Event Apart are our sponsor again this week, I'm very excited to be finishing my 2018 conference year by presenting my new An Event Apart talk for the first time, and I'm speaking at every 2019 event, I hope to see you at one of them. Regular readers will know I am a fan of the Developer Tools in Firefox. They are currently running a survey to get feedback on these tools. This is the next part in the excellent A List Apart series on how our HTML and CSS becomes a webpage users can interact with. So this isn't layout, but this talk has been useful to me and I thought it might be useful to you. Val explains the web animation landscape and helps you answer the question of what to use when you want to add animation to your UI. I had fun yesterday at Øredev presenting a new talk on some new things in CSS that I find interesting. Here are the slides and code examples, which may or may not work in your browser! A short investigation into the subject. As Andy Clarke points out, "Implementing dark mode is easy, but designing for it is less so. " He gives some practical tips for designing for dark mode. I added some Houdini examples to my presentation yesterday, and found all kinds of helpful things in this collection from Vincent De Oliveira. Web design is more challenging than ever. Attend An Event Apart to be ready for anything the industry throws at you—from design systems to variable fonts, from CSS Grid Layout to inclusive animation, and beyond. You’ll gain essential insights and immediately useful knowledge, tips, and techniques from the developers, designers, and strategists leading the most important movements in front-end web design. And at AEA, you don’t just learn from the best, you interact with them—at lunch, between sessions, and at our famous first-night Happy Hour party. So get ahead of the curve. Join the forward-looking attendees and speakers at An Event Apart for three days of design, code, and content that will inspire you for years to come. CSS Layout News readers save $100 off any 2 or 3 days with code AEACSSN.